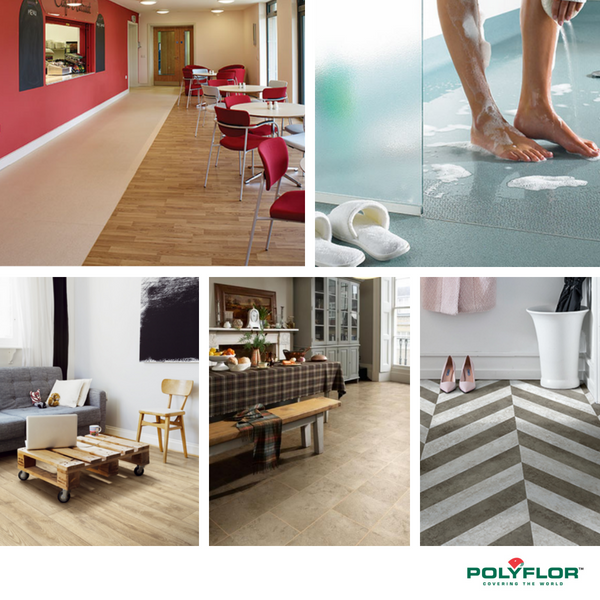 Producing Residential and Commercial Flooring for over 60 years, Polyflor are one of the leading vinyl flooring manufacturers in the world. Polyflors foundations originate in Manchester, UK and they have gone onto to produce some of the finest sheet vinyl flooring and luxury vinyl tile products on the market today. At Bramley Carpets we offer all of Polyflors ranges which vary from heavy duty commercial flooring designed for use in warehousing and hospitals to wood and stone effect luxury vinyl tiles that are designed for residential Kitchens and Bathrooms. Luxury Vinyl Tiles- Polyflors LVT portfolio covers a wide selection of wood and stone effect designs along with beautiful water-jet bespoke patterns that are specially cut to create a unique looking floor. Popular ranges such as Camaro, Camaro Loc, Expona, Colonia and Affinity are all available at Bramley Carpets. Commercial Safety Flooring- Designed for use in commercial premises such Hospitals, Supermarkets and Warehousing, Polyflors Safety Flooring options are endless with such ranges a Polysafe Hydro, Standard, Mosaic, Wood FX and Ultima being available. Acoustic Flooring- Manufactured with high sound reduction properties, such ranges as Secura, Silentflor, Acoustic FX and Designatex offer a perfect solution to reduce levels of impact sound in both residential and commercial environments. Rubber Flooring- Designed for heavy traffic areas where durability, underfoot comfort and cigarette burn resistance are required, Saarfloor Noppe Stud Tiles not only look great but will stand up to almost anything.